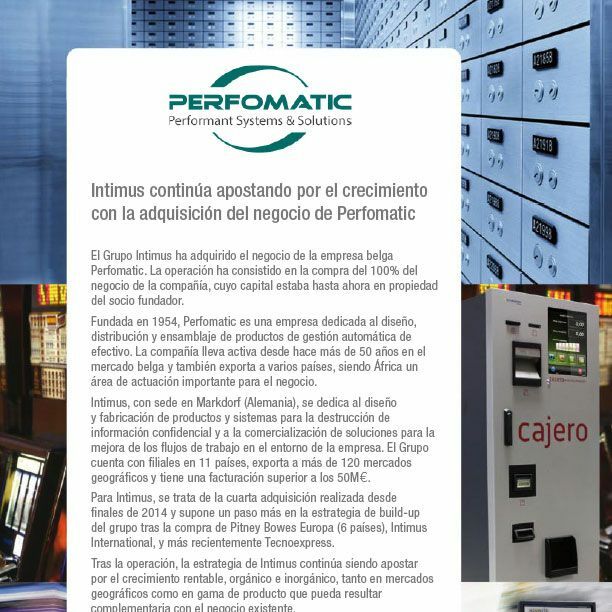 Intimus Group has acquired the business of the Belgian company Perfomatic. The transaction consisted in the purchase of 100% of the company’s business, whose capital was controlled by the founder of the company. an important area of activity for the business. Intimus, with headquarters in Markdorf (Germany), is dedicated to the design and manufacture of products and systems for the destruction of confidential information and offers a full range of solutions to improve workflows in business environment. The Group has subsidiaries in 11 countries, exports to more than 120, and the turnover is higher than €50M. For Intimus, this is the fourth acquisition since the end of 2014 and is a further step in the Group’s build-up strategy after the purchase of 6 european companies from Pitney Bowes Europe, Intimus International, and most recently Tecnoexpress. After this acquisition, Intimus’s strategical focus is to grow in a profitable way, either organically or inorganically, and both in geographic markets and in product ranges that can complement the existing business.